Hello Everyone! Today we are shining a spotlight on my latest project. This was a lengthy one. After going through all the changes that needed to be made it ended up working out better to just tear the entire house down and rebuild. This was the first official project for Studio Em Interiors a year and a half ago and the biggest one for Studio Em Interiors at that time. It was exciting to start such an involved project and so much fun to watch it come alive as the building process took place over the summer. As you can see there was a huge change in the exterior look of the home. The before image of the homes exterior. The After image of the exterior. The clients I had to work with on this project were a dream! I could not have asked for a more kind and fun couple to work with on such an extensive project. It is sad when projects like this come to a close because I really will miss my clients. They were wonderful. 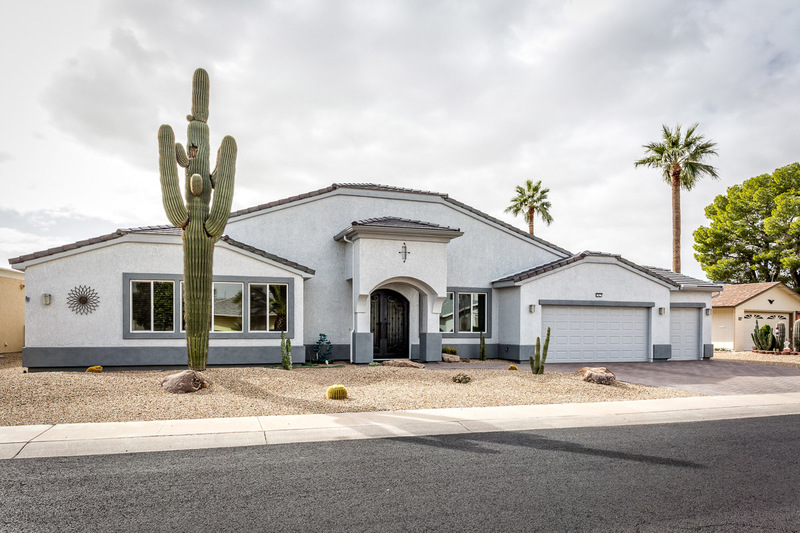 We remodeled a majority of the home with new fixture, finishes, and furnishings. Some of their furnishing were kept for this project. 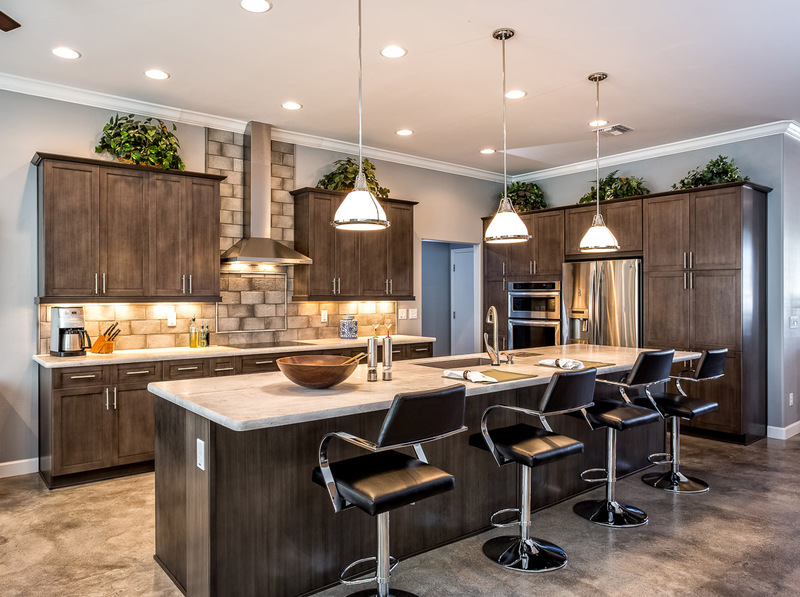 The main focus was on the kitchen and bathrooms. The clients loved the look of these hand painted grey cabinets. We used them throughout the home for the kitchen, both bathrooms, and a bar area. 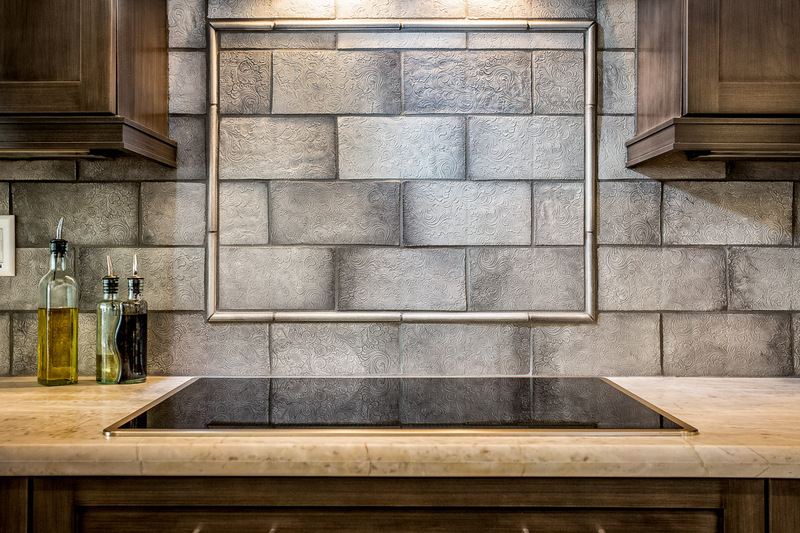 We wanted a gorgeous backsplash that popped and really brought some dimension to the space. We found this wonderful handmade concrete tile with an incredibly detailed stamped design on each of them. 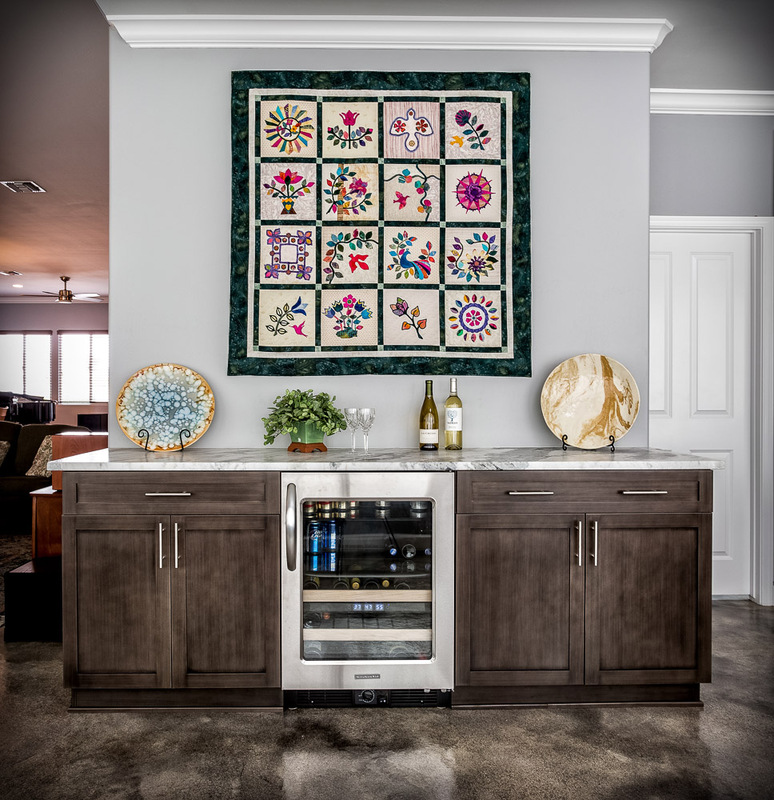 The handmade nature of these tiles had variation in the sizing, thickness, and coloring of the tiles which really added some dimension to the space and makes for a gorgeous element in the kitchen. We carried a stained concrete floor throughout the home and kept with the same grey color on the walls throughout the home. 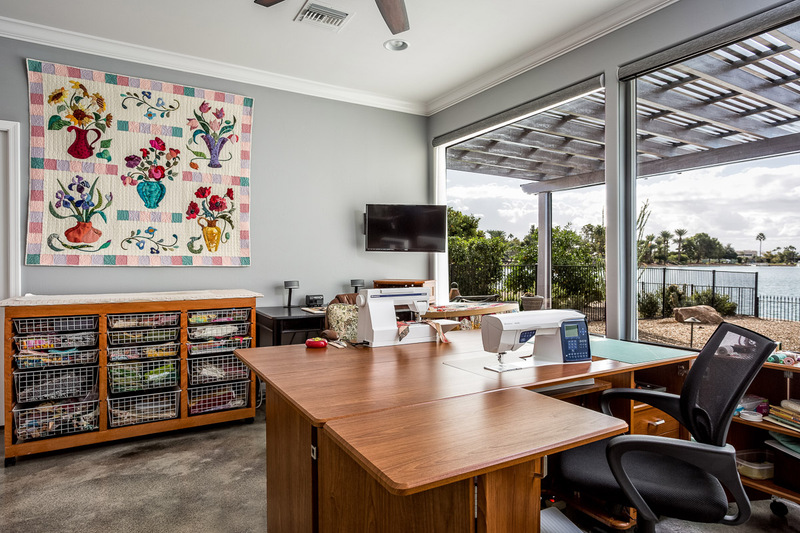 My client hand makes quilts that she loves to use as wall hangings to add pops of color to the space so we kept the colors fairly neutral so as not to compete with the fabulous quilts she makes. In the hall bathroom we used a textured, linen like tile for the shower walls and a hexagonal tile for the shower floor. 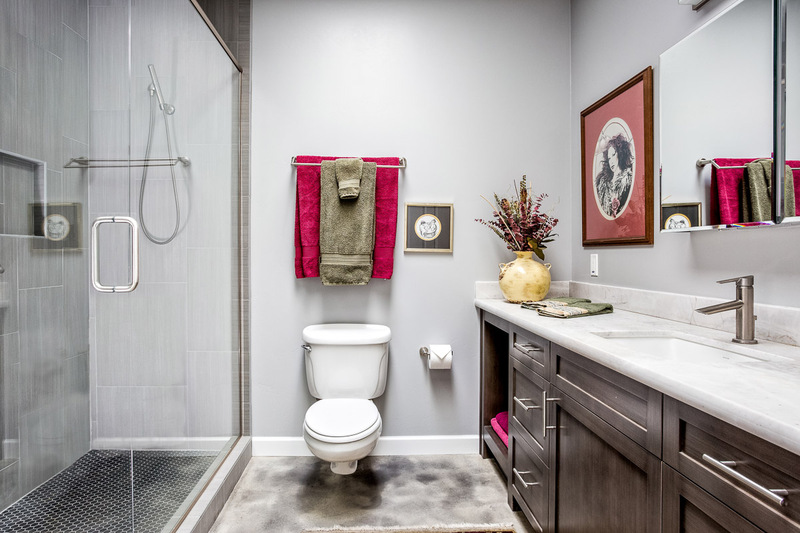 The fixtures, pulls, and accessories used were all in a brushed nickel finish. 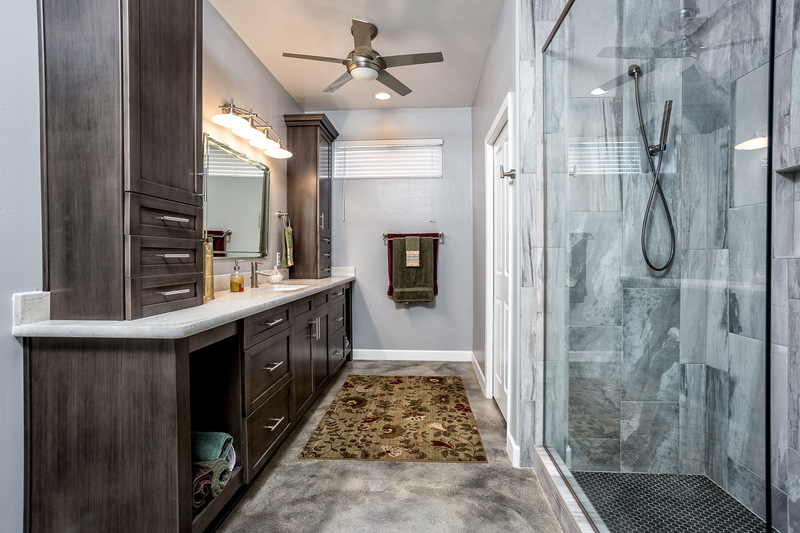 The Master Bathroom has the same hand painted grey cabinetry with a stone look grey shower tile that adds interest and dimension to the space. We chose to use the same black hexagonal tile on the floor in this bathroom as well. We have mix of open shelving and closed storage and all accessories and fixtures are in a brushed nickel finish. This project has been complete for some time now and it was wonderful to finally get it photographed so I can share these images with you today.